The Rivers state government has responded to the Press Conference held by the Governorship candidate of the All Progressive Congress in the April 11th governorship election in Rivers State Dr Dakuku Adol Peterside where he claimed that the PDP and Governor Wike had a foreknowledge of the ruling by the Supreme Court. The late foremost Nationalist Dr. Nnamdi Azikiwe is noted to have warned that if you do not answer false allegations made against you by your opponents, those allegations soon gain currency and belief. It is with this admonition in mind that we are constrained to reply to the childish and infantile gibberish ranted today in the guise of a Press Conference by the Defeated APC gubernatorial candidate in Rivers State, Dr. Dakuku Adol Peterside at the APC Secretariat, Forces Avenue, Old GRA Port Harcourt. 3. We shall address each of these items. “Although we have accepted the Supreme Court verdict, it would be remiss of me not to point out that this is also an opportunity for our people to engage in deep introspection on the electoral process. Beyond party affiliation, must we continue to allow the electoral process to be subject to the whims and caprices of anti-democratic elements, especially those who deploy personal militia to molest and even kill voters; those who hold the electoral umpire captive or compromised; and thus generally prevent electoral outcomes reflective of the will of the voters, as envisaged by law? It is understandable that an attitude of cynical expediency in some politicians may inevitably conclude that “the end justifies the means”. However, those who are governed by such a cynical mentality need to be reminded that a huge moral burden would perpetually sour such temporary “victories”. Like the myth of Sisyphus, it is surely a backward slide in our political evolution. Let us think deeply please. 6. Dr. Dakuku Peterside and his party’s true reaction to the Supreme Court victory was given during the former’s “visit of incitement against Rivers People and the Peoples of the Niger Delta” to Chief John Odigie Onyegun, the APC Chairman. At that meeting in which Dakuku Peterside was inciting the President and the people of Nigeria against the peoples of the Niger Delta and the Government and people of Rivers State, Chief John Odigie Onyegun said “I still find the judgment on the Rivers State governorship election totally astonishing”. Chief Onyegun then proceeded to announce that the Supreme Court would be probed for doing their work simply because verdict was not given in favour of Dr. Dakuku Peterside. 7. Dr. Dakuku Peterside and his APC have not accepted the Supreme Court verdict and would do anything to destroy the Supreme Court and the integrity of its Justices for daring to uphold existing jurisprudence. 8. 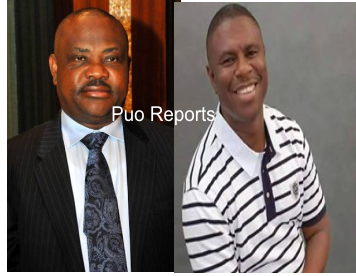 The attack on Governor Wike who merely warned that nobody should come to Rivers State to rig elections is contrived to misinform and create confusion so that the APC would, as promised by their National Chairman to Dakuku Peterside, forcefully intervene in Rivers State by means of election rigging in order to win all the seats up for re-election in the State Assembly with a view to impeaching Governor Wike. 10. Only riggers and potential riggers should therefore be worried about the statement of Governor Wike. iii. The respected Odilis’ were used to procure the verdict of the Supreme Court. 13. These allegations are scornful, demented and laughable. 14. Rotimi Amaechi, Dakuku’s mentor is known to have a reputation of boasting about judicial verdicts before they are given. See the publication on page 11 of the Nigerian Pilot of Monday January 25 2016 by Abia Justice Forum. Rotimi Amaechi has never bothered to deny any of the allegations credited to him in the publication. 15. Why then did Governor Wike lose his appeal to the Supreme Court on the issue of proper venue where the Rivers State Governorship Election Petition Tribunal should sit? After all, the distinguished Honourable Justice Mary Odili was on that seven-man panel of the Justices of the Supreme Court that dismissed Governor Wike’s appeal. Then, “there was nothing fundamentally wrong with the Supreme Court”. Now that she was not even on the panel that heard the Rivers State Governorship appeal, she is accused of interference. We ask again, was Justice Odili also the one that influenced Akwa Ibom, Ogun, Delta, Abia, and other States’ Governorship appeal at the Supreme Court? 16. Clearly the advice that was given by Dr. Peter Odili a medical practitioner and leader of the Peoples Democratic Party (PDP) in Rivers State was purely fatherly which Governor Wike took and it served him well unlike Dr. Dakuku Peterside and his master Rotimi Amaechi who never seek wise Counsel or allow themselves to be guided by wise counsel. 17. Moreover, Governor Wike just took a trip down memory lane naming many persons who assisted him on his route to victory. He never named Honourable Justice Mary Odili as one of such persons. He named Dr. Peter Odili CON. Why pick on the noble Justice? 18. Finally on this point, how can Governor Wike make revelations on a Judgment that has not been read? 19. The Governor knew that given the level of support he has in Rivers State, the determination of the APC to win Rivers State at all cost in order to have at least one oil producing state in its kitty and the will of Rivers people and Niger Deltans to resist the rigging overtly threatened by the APC to procure victory there surely would be violent in the event of a re-run. 20. As a patriotic son of Rivers State and the Niger Delta, Governor Wike chose to sacrifice his ambition in order that defenceless Rivers People and Niger Deltans may live along the lines of the Jonathanian philosophy that his ambition is not worth any persons’ blood. We ask, what is wrong with such a noble sacrifice? Must Dr. Dakuku and Mr. Amaechi in their thirst for blood refuse to see nobility in self sacrifice? 21. Governor Wike has never insulted the person or office of Mr. President, Nigerians know how much former Governor Amaechi and his co-travellers poured abuses and invectives on former President Goodluck Jonathan without any words of caution by the leadership of APC. 22. It must be observed that Governor Wike’s commitment to the fight against corruption is total, complete and unequivocal. It is on record that upon assumption of office he instituted a Commission of Inquiry with judicial approval. That Commission’s Report has been given approval in a Government White Paper. One of those indicted is Mr. Rotimi Amaechi, former Governor of Rivers State. 23. The Governor merely condemned a fight against corruption that abrogates the rule of law, is one sided and is obviously targeted at political opponents. These are concerns that all Nigerians are freely expressing. Why pick on Governor Wike? 24. The Governor never referred to our gallant soldiers who lay their lives on the line everyday as “boko haram”. He merely alluded to the fact that even if the soldiers hardened and experienced by their fight against boko haram are brought to assist APC rig elections in Rivers State as the APC is boasting that they would, they still would not be able to defeat the will and resilience of the Rivers and Niger Delta People. 25. The whole purpose of the Dakuku Peterside press conference is to continue the path of inciting the Presidency and the Armed Forces against the people of Niger Delta and Rivers State. It is a cynical reaction to his electoral and judicial defeats. He surely would not win any victory by diverting attention. 26. We call on Rivers People and the good people of the Niger Delta to keep gallant watch over their democracy and their dignity from assault by traitors to our commonwealth and common heritage.